Priscilla was feeling just about the sickest she thought she ever could. That was UNTIL she decided to have a look at herself in the mirror. There, all over her face, were bright red spots. My goodness! She even found some spots on her TONGUE! This was the third day she had stayed home from school because of having chicken pox. Boy, was SHE ever glad those spots would be gone in just a few short days! But what about people who had spots that would NEVER go away? Spots that would eventually make them so sick they would DIE? HE WAS A LEPER AND HE WAS GOING TO DIE! 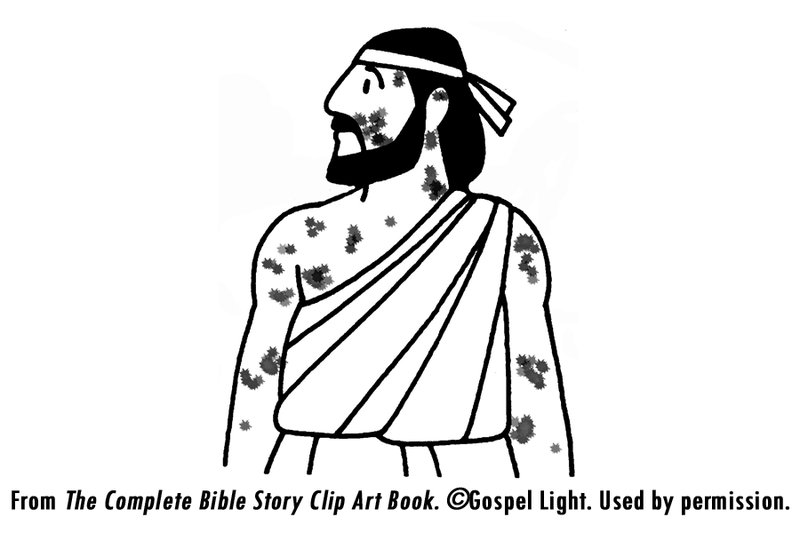 There were many who were lepers in Naaman's day. Their skin was being eaten away, little by little, by the terrible disease of leprosy. 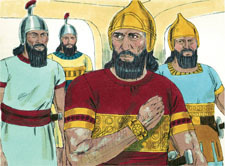 Naaman's Syrian army had gone to war against the Israelites. Many of God's people were killed, but some were taken captive and brought back to Syria to become servants. 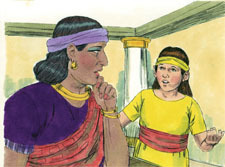 Among these captives was a young girl who had been given to Naaman's wife to serve as her maid. The news of Naaman's leprosy quickly spread throughout his house. One day, the little servant girl overheard the servants whispering one to the other: "What a pity! It is SO SAD that Namaan has been struck with such a dread disease. If only there was something we could do to help him!" Remembering the Prophet Elisha and the wonderful miracles he had performed back in the land where she had come from, the young girl thought to herself, "If only I could persuade my master to visit the Prophet Elisha. I know God could HEAL him of this terrible leprosy!" One day, when the little girl was waiting on her mistress, she could no longer keep her thoughts to herself. Before she realized what had happened, she blurted out: "I wish my master would go to see the prophet in Samaria. He would heal Naaman of his leprosy!" Naaman's wife nearly DROPPED the food she was about to put in her mouth. She quickly stopped her eating and asked the young girl to sit down beside her. "Now tell me ALL about this. WHO is this prophet?" her mistress asked. "I want to hear EVERYTHING you know about him." The servant girl excitedly told her many stories of the wonderful miracles the Prophet Elisha had done. Soon the little maid's words reached Naaman and Naaman went and repeated to the King what the young girl had said. "Go and visit this prophet," the King told him. 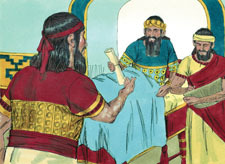 "I will give you an official letter to present to the King of Israel, to help explain the purpose of your visit." So Naaman started out on his journey, along with his servants. He took with him many gifts of silver, and even more gifts of gold, and also a gift of ten changes of clothing. 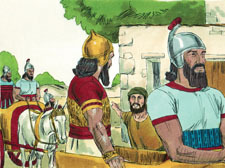 Soon Naaman and his servants reached the palace of the King of Israel and Naaman, the Syrian commander, was ushered in before the King. The King took the letter Naaman handed to him and began reading out loud: "The man bringing this letter is my servant Naaman. "I want you to HEAL HIM OF HIS LEPROSY." When the King of Israel finished reading the letter, he TORE his clothes in anger and said to his servants, "This man sends me a leper to heal! "Am I GOD, that I can kill and give life? "I know what the King of Syria is REALLY up to. He is only looking for a fight." Not long afterwards, Elisha the prophet heard what had happened in the palace and he sent a message to the King: "What's wrong? Why have you torn your clothes? Send this man to ME and I will see he learns that there is a true prophet of God here in Israel." 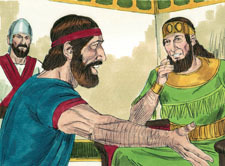 So Naaman climbed back into his chariot and headed toward Elisha's home. Soon he found himself standing at Elisha's front door. To his amazement, Elisha never came to the door, but, instead, sent a messenger out to meet him. "Go and wash in the Jordan River seven times," Elisha's servant said, "and your skin will be cleaned, and you will be healed of your leprosy." Naaman became very angry and left the house in a RAGE! What did the little captive girl tell her mistress? What if she had kept that to herself? What happened when the king of Israel received the letter from the king of Syria? 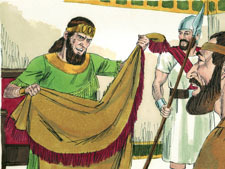 What did the Prophet Elisha tell Naaman he needed to do in order to be healed from his leprosy? When you find yourself in a situation that you're afraid will NEVER go away, instead of becoming angry and giving up, call out to God for help. "...for I am the LORD that healeth thee" (Exodus 15:26b). and giving up, help me to call out to You for help.